Description: The Gold Star Stagecoach has rolled into town with two bags of the U.S. mail. En route, the horses pulling the stagecoach "gallop" alternately with a "clippity clop, clippity clop" sound. The courageous driver holding the reins sways back and forth along the "bumpy western dirt road". The top of the stagecoach and the trunk have hinged lids to place the two mail bags inside. FPT1648 - Red wooden stagecoach with red and yellow paper lithographs on the sides with pictures of children looking out the stagecoach windows. The door is marked "Gold Star Stage" and the top is marked "Fisher-Price Stage Lines" in yellow. 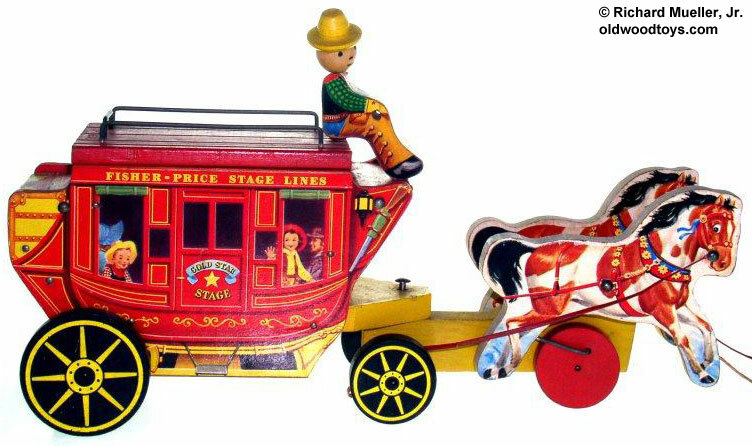 The stagecoach has a red wooden hinged lid with 3 black metal luggage supports around the top edges. The lid has an attached wooden driver figure with paper lithographs on the sides, a round wooden head with a printed face, and a round yellow wooden hat. The figure holds a vinyl rein in his hands. One side of the rein is attached to one of the two horses pulling the stagecoach, and the other side of the rein is attached to the other horse. The horses are flat wooden cut-outs with paper lithographs on the sides of white horses with brown spots, black mane and tail, and a harness with yellow flowers. When the stagecoach is pulled , the horses rock back and forth alternately and make a realistic hoofbeat sound while the driver sways from side to side. The stagecoach rolls on 4 black wheels that have yellow painted spokes, and the 2 horses have 2 wooden wheels under them. Measures 15-1/2" long, 8-1/2" high, 4-3/4" wide. 2 each - FPT1675 - Flat rectangular wooden mail bag with a paper lithograph on both sides of a mailbag marked "U.S. MAIL". 1954 original retail price was $3.00 in the East and $3.25 in the South and West.